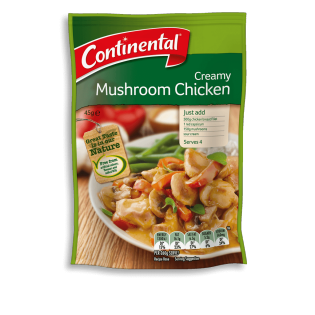 Using Continental's recipe bases, enjoy our aromatic creamy mushroom, chicken & capsicum pasta. Learn how to create this authentic, family favourite meal today. Corn starch, sugar, vegetable powders (tomato, onion), natural flavours, salt, potato starch, maltodextrin (from wheat), milk powders (cream, skim milk), paprika, burnt sugar, yeast extract, natural colour (carotene), sunflower oil, garlic extract. The best recipe base! Please please please bring it back!!!!! So easy to make and tasty. except woolworth's and coles don't stock it anymore bring it back!!!!!!!!! Hi Bel, sorry to disappoint you but this has been deleted from the range which is why you can't find them anymore. A family faVe in our household. Like other comments please please bring it back. Tried the chickeN stroganoff and its tastEless In comparison. Cmon continental please listen to All these reviews! Our family loves this recipe.It is saD to hear It’s discontinued.The REASON it has poOr sales is due to the poor set up in local superMarkets. Why has this product been dEleted??? Pleae bring it back its our familys favourite!! Sorry to hear that this deletion has caused such sadness. We'll make sure the team hears of this. Have used this recipe base for many years, have been unable to buy anywhere and now discovered it has been discontinued????? Why?? How can this possibly not be popular enough to keep producing??? Absolutely love this recipe base and so dissapointed to see it is no longer availabLe. Looked everywhere for this for ages and dont understand why it has been discontinued. Why did you get rid of it?? Please bring it back. We all want it back!!! Sorry to hear that this deletion has caused such sadness. Products are often deleted due to poor sales & low distribution. We'll make sure this gets to the team.